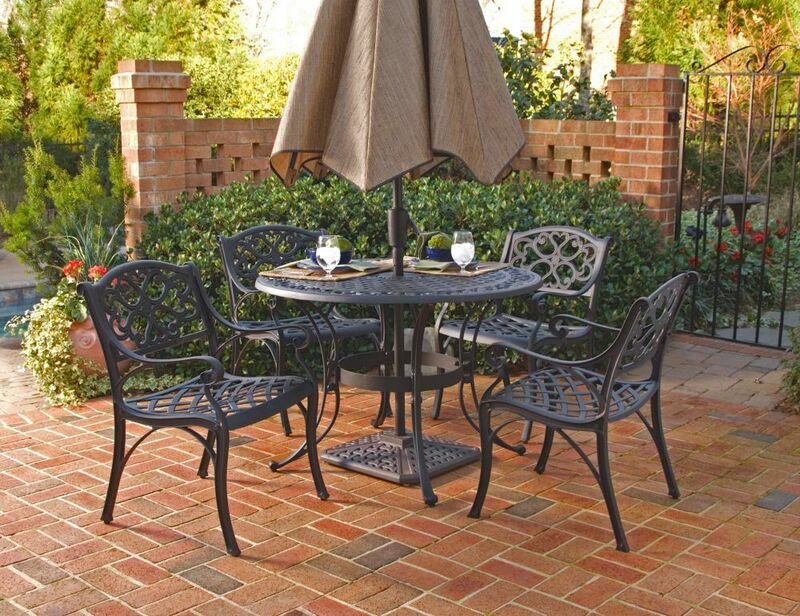 Biscayne 5-Piece Patio Dining Set with 48-inch Black Table and Four Arm Chairs Home Styles Biscayne 5-Piece Set includes 48-inch Round Outdoor Dining Table and Four Arm Chairs. Set is constructed of cast aluminum with a black Finish. Features include powder coat finish sealed with a clear coat to protect finish, attractively patterned table top has center opening to accommodate umbrellas, and nylon glides on all legs. Biscayne 5-Piece Patio Dining Set with 48-inch Black Table and Four Arm Chairs is rated 4.2 out of 5 by 5. Rated 1 out of 5 by Disappointed from Beautiful Set but I have a problem I have yet to complete assembley of 2 chairs. Sent an email on July 27, 2:02pm to servicedesk@homestyles-furniture.com to obtain 2 (D) side frames to complete assembley. I have not heard from them. The set is paid in full. Please expedite my request and I will write a more positive review. Rated 5 out of 5 by Lag from Very beautiful solid set. ... Very beautiful solid set. Rated 5 out of 5 by Anonymous from Patio set Love the Biscayne Patio Set! Good quality, sturdy, and lovely. This 5-piece patio dining set comes with chair cushions? What color?? This product does not come with cushions.